We welcomed her into our hearts many months ago and into our home last Monday. 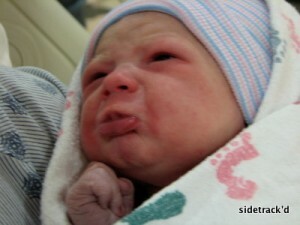 Baby girl arrived healthy and happy (despite the pouty face) weighing 7 pounds 6 ounces and measuring 19.5 inches. Okay, so I haven’t blogged in…well, in forever. I wish I had a really good excuse, like I was caring for a newborn, but, alas, not yet. ~In November we bought a minivan. You might remember that I was having a really hard time with the idea of driving a minivan; I have to admit, however, that it really isn’t bad. We ended up getting a Honda Odyssey, and I like it a lot. ~Last week I washed several loads of laundry to get all of her tiny little clothes ready to wear, blankets ready to wrap up in, and burp cloths ready to spit up on. We have approximately 3 dozen burp cloths…is that normal? ~Her crib is in her room and the bumper pads are washed, but there is no sheet on the bed, the changing table is filled with non-baby items, and Little’s name is still hanging on the wall. Guess we still have some work to do there before she moves into the crib. ~She is well stocked on diapers. We should have plenty of tiny disposable diapers to get us through the first week or two, and I’ve got the GroBaby and BumGenius stash waiting in the wings. ~The infant car seat is installed in the van just waiting to bring her home from the hospital. ~I am 39 weeks 4 days pregnant. Officially the longest I’ve ever been pregnant. And she doesn’t seem to be in any hurry to make her appearance. I figure she’s waiting until later in the week when it’s supposed to snow. Or possibly for Spring. ~I alternate between being extremely ready for her to arrive and perfectly content for her to stay right where she is. I think this has more to do with the potential reactions of the 3 year old and 20 month old than the baby herself. ~That said, I can’t wait to meet her. To hold her. To see what she looks like. And I think that about sums it up. I’ll keep you posted. You are currently browsing the Sidetrack'd weblog archives for January 2010.